FLV Spider :: Save online videos to your Mac and iPod! Save online videos to your Mac / iPad / iPod / iPhone! Do you see a cool online video? Would you like to save it to your Mac or to your iPad or iPhone? Nothing is easier! FLV Spider will automatically capture all online Flash videos, opened in your web browser, and will show them in a sortable list with preview. FLV Spider can convert live RTMP / RTMPT streams (like Internet TV) into Flash Video format and save them to your Mac and/or iPod. You can provide a meaningful title for each of captured videos. You can do it as easy as to drag&drop a video title from web page into FLV Spider's captured file list. 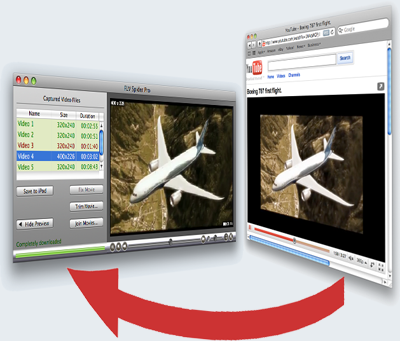 Save any captured video to your Mac in MP4 or FLV video file format. It is possible to crop / resize video files before saving. Save any captured video to iPod as easily as to click a button.